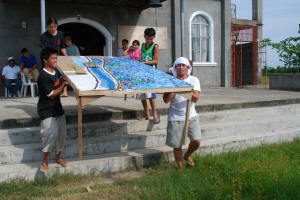 This 1:2,700-scale model (no vertical exaggeration) of the the Municipality of Masantol, Barangays Alauli, Balibago, Bagang, Sagrada, Nigui, Sapang Kauayan, Province of Pampanga, Philippines was completed in year 2009. 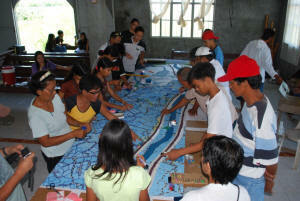 Note: The model was produced in the context of the Participatory Methodology for Assessing and Managing Risk (PAMAMRISK) project and specifically within the framework of a Community-Based Disaster Risk Reduction (CBDRR) initiative requested by the local community leaders and the local government. The P3DM method was introduced by the scientists. 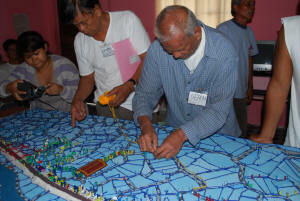 The model features the collective knowledge of local residents and representatives from the Municipal Government of Masantol, Center for Emergency Aid and Rehabilitation, Inc., Ugnayan People’s Organization, Tarik Soliman High School, and the University of the Philippines Diliman. The 3D model was produced in two phases. The first one in August, 2008 and the second one in August 2009. The 3D model has subsequently been used for vulnerability mapping activities. Results included the following: Assessment of hazard, vulnerabilities and capacities, establishment of a CBDRR plan and methodological learning. Additional information on the case is found here.